In this case there is an error with respect to Skype. The systems does not have the public key for this package, so it complains and prevents the system from downloading something which is not secure (and something that we want!). curl URL | apt-key add ). This adds the GPG key in the /etc/apt/trusted.gpg file, and now if we try again to update the system we will see no error or warning. Hint: to see all the contents of the trusted.gpg file just type: apt-key list ! I have followed the pip install approach to add everything that I wanted for Python. Even though I did the same for jupyter when I was starting it (“jupyter notebook”) it would only start the Python 2 kernel, although Python 3 “was there” but not active actually. corresponding to Python 2 and Python 3, respectively. The problem lies in the version of python used, as what we see after the ‘”argv”: [‘ line is “python” in both cases. This is ok for Python 2 since this is the default way to invoke it. But not for Python 3, which needs “python3” (by default). So, the first option may be left as it is, but the second needs to change to “python3” to properly point to the correct version. However, this was not working and I found no reason why (especially since “python” and “python3” invoke the proper versions). In any case a robust solution is to provide the full paths, i.e. “/usr/bin/python” and “/usr/bin/python3”. I started by downloading the net/CD image for Debian 9 (‘stretch’) and putting it to a USB key. I plugged the key at the laptop and started the booting process. First problem: even though it could see the USB and it showed the Debian distro it wouldn’t start. I couldn’t figure out at all why up to the point that I noticed that the new hardware has new BIOS technology called UEFI (yes … I hadn’t installed anything for a looong time!). I went to BIOS > Startup > UEFI/Legacy Boot which was ‘UEFI only’ and I changed the CSM Support to ‘Yes’. But this alone was not enough. So, I changed the UEFI/Legacy Boot from ‘UEFI only’ to ‘Both’ [where I think it should be also to put ‘Legacy only’ if you plan to run on Linux only, but if Win are necessary then leave both]. Then the USB key would finally load and the installation could start. With the graphical installation of Debian the screen goes blank after some time of inactivity, which you can correct with a small movement of the mouse. But since I didn’t have any mouse connected I though that something was wrong. It took me a few iterations before I understand that, which I find ridiculous when you install an operating system. I think that the monitor should be on at all times! The installation went on without any other issues. After logging in the new system, I updated all packages. At the beginning the trackpad (touchpad) could work with some lag. The trackpoint didn’t work at all but I didn’t pay any serious attention to that. I installed the wifi driver (firmware-iwlwifi, for Intel chips) and after that the touchpad wouldn’t work at all. This is a known problem and many solutions are offered (updating to latest kernel 4.18 and to Debian testing didn’t work). However (and after some iterations of the installation process) I finally went to BIOS > Config > Keyboard/Mouse > Trackpoint and I ‘Disabled’ it. That way the touchpad works without any issue. [At this point it is not so urgent for me to fix this, but I will come back in the future]. There is a know issue that certain BIOS version have serious problems to recover when suspending the laptop. I learned that the hard way: after suspending the laptop when I was trying to put my password over and over again, as every time it would accept only a few characters before it accepted that raised errors of incorrect password. I had to brutally shut it down (pressing the power button) but for whatever reason the x-server would start. So I had only text access and I couldn’t restarted it (of course I may have missed some more appropriate approaches). Anyway, I re-install Debian from scratch. In order to solve that I needed to update the BIOS. I run fwupd to get the latest BIOS version but it refused. The installed version was 1.25 while only those >1.27 are upgradable with fwupd. Now the only solution is the classic one, i.e. download the last Thinkpad BIOS update (bootable, for Windows) and install it directly from a USB. After having downloaded the .iso image I followed the instructions by Vivek Gite (with most important part the video showing what to do during the actual BIOS installation). Take care that you know exactly which device is the USB key you are going to write to, else you are going to delete data! Crossing fingers and … booting again! phew… everything is working and indeed I have now the latest version (1.34). As a (much) later version of the BIOS it should have fixed the issue with suspending mode. Did it work? So far I have experienced any critical issues. What I did noticed though is that that I could feel it a bit hot when suspending. I was going through the BIOS setting and I discovered that there is an option now with respect to the sleep state (I don’t know if it was present in the previous version): Config > Power > Sleep State, which has two options ‘Windows 10’ and ‘Linux’. I obviously picked the last one to optimize the performance and I think it is working now. Finally, the time that I would actually install what I need to start working has arrived! Since Python2.x and 3.x exist I was going to use pip only to install all necessary packages. I installed pip for both Python versions from the distro repositories. Checking the pip site I saw the following recommendation: “Ensure pip, setuptools, and wheel are up to date, by doing: python -m pip install –upgrade pip setuptools wheel”. Be cautious if you’re using a Python install that’s managed by your operating system or another package manager. get-pip.py does not coordinate with those tools, and may leave your system in an inconsistent state. You can use python get-pip.py –prefix=/usr/local/ to install in /usr/local which is designed for locally-installed software. Yellow hypergiants are evolved massive stars that were suggested to be in post-red supergiant stage. Post-red supergiants that evolve back to the blue, hot side of the Hertzsprung-Russell diagram can intersect a temperature domain in which their atmospheres become unstable against pulsations (the Yellow Void or Yellow Wall), and the stars can experience outbursts with short, but violent mass eruptions. The yellow hypergiant Rho Cas is famous for its historical and recent outbursts, during which the star develops a cool, optically thick wind with a very brief but high mass-loss rate, causing a sudden drop in the light curve. Here we report on a new outburst of Rho Cas which occurred in 2013, accompanied by a temperature decrease of ~3000 K and a brightness drop of 0.6 mag. During the outburst TiO bands appear, together with many low excitation metallic atmospheric lines characteristic for a later spectral type. With this new outburst, it appears that the time interval between individual events decreases, which might indicate that Rho Cas is preparing for a major eruption that could help the star to pass through the Yellow Void. We also analysed the emission features that appear during phases of maximum brightness and find that they vary synchronous with the emission in the prominent [CaII] lines. We conclude that the occasionally detected emission in the spectra of Rho Cas, as well as certain asymmetries seen in the absorption lines of low to medium-excitation potential, are circumstellar in nature, and we discuss the possible origin of this material. In ATel #12224 we reported the Hα emission, derived from a wide-field photometric survey of the Small Magellanic Cloud (Maravelias et al. 2017, IAUS 329, 373; Maravelias et al. 2019, in prep. ), of the proposed optical counterpart source [M2002] 20671 to the X-ray transient XTE J0052-723 pulsar (SXP 4.78; Swift J005139.2-721704; ATel #12209). In addition to this clear detection, the work of Bonanos et al. (2010, AJ, 140, 416) showed that the IR colors of this source ([2dFS]0811; J=15.54 mag, J-[3.6]=0.56 mag) are indicative of a “photometric” Be star, defined as sources with an intrinsic color of JIRSF-[3.6]>0.5 mag. However, to confirm the nature of the counterpart optical spectroscopy is needed. We obtained optical spectra using the LDSS-3 spectrograph on the 6.5m Clay/Magellan telescope (Las Campanas Observatory). The observations were performed on Nov. 20, 2018, acquiring two exposures of 600s each with a 1″ slit using the VPH-All grism (resulting in a 2630 — 10859 Å wavelength range, at a nominal dispersion of 1.9 Å/pix). The spectrum shows a clear single-peaked Hα line in emission, with a corresponding equivalent width of -10.65±0.14 Å. This is the first optical spectroscopic confirmation of the presence of Hα in emission. We note that Hβ appears in emission as well. The spectral classification was based on the blue part of the spectrum and the classification scheme used in Maravelias et al. (2014, MNRAS, 438, 2005). The presence of the OII+CIII 4640-4650 blend and the strong HeI 4471 line point to an early-type star (spectral type up to B2), which is consistent with the absence of the MgII 4481 line and the weak SiII 4552 triplet line. The HeII 4200 and 4686 lines, which are indicative of B0.5 and earlier-spectral types, are absent, thus pointing to later types. Combining these criteria we constrain the optical classification to a B1-2e source (with an error of 0.5 subtype). This is consistent with the early-type B star classification proposed in ATel #12229, as well as the previous classification of B0-B3 by Evans et al. (2004, MNRAS, 351, 601; source ID [2dFS]0811). Thus, we provide the first optical spectrum with Hα emission of the optical counterpart of XTE J0052-723, further confirming its Be/X-ray binary nature. The ATel #12224 was released on 17 Nov 2018 (19:01 UT) regarding the identification of the proposed optical counterpart to the source XTE J0052-723 (SXP 4.78; Swift J005139.2-721704) as an Hα emitting OB star. The full text follows. ATel #12209 reported the detection of a new X-ray transient in the Small Magellanic Cloud (SMC), Swift J005139.2-721704, exhibiting outbursting activity. The system has been classified as a new SMC high-mass X-ray binary based on its identification with the B-type star [M2002]20671. NICER followed up this source immediately (ATel #12219), reporting an absorption-corrected luminosity of LX ~7×1037erg s-1 (0.5-8 keV; 60 kpc). Temporal analysis of NICER and Fermi/GBM observations (ATel #12222) identified Swift J005139.2-721704 with the known X-ray pulsar XTE J0052-723 (SXP 4.78). Evans et al. (2004, MNRAS, 353, 601) obtained a refined B0-3(III) spectral type for [M2002]20671 (= [2dFS]0811) based on optical spectroscopy, but they do not report Hα emission. Here, we report the identification of the SMC star [M2002]20671, and thus XTE J0052-723, with an Hα emitting source, which confirms XTE J0052-723 as a Be/X-ray binary (Be-XRB) pulsar in the SMC. This source is identified in Hα and R-band observations covering the SMC almost completely (Maravelias et al. 2017, IAUS 329, 373) using the Wide Field Imager on the 2.2m MPG/ESO telescope at La Silla (16/17 November 2011) and the MOSAIC-II camera on the 4m Blanco telescope at Cerro Tololo (15/16 December 2011). The Hα emitting source is found at RA=00:51:38.78 and DEC=-72:17:04.7 (better than 0.2″ relative astrometry with respect to the 2MASS catalog). It is located 2.2″ away from the Swift position (ATel #12209), with Hα and R-band magnitudes equal to 15.476±0.006 and 15.613±0.008, respectively. The resulting Hα-R color is -0.137±0.010 mag with an SNR~13 above the continuum and an Hα excess significance of ~6σ above the Hα-R baseline value. The only nearby source with significant Hα-R excess is much fainter (Hα and R ~22 mag), has a lower SNR (~4) and is located at a larger distance from the X-ray source (~6″). Observations with the IMACS f/2 camera on the 6.5m Magellan Telescope (4 October 2004) give B=15.652±0.009 mag and I=15.524±0.017 mag (Strantzalis et al. 2018, IAUS 344, 453; Strantzalis et al. 2019, in prep. ), compatible with an OB star. All the identifications described above secure the nature of Swift J005139.2-721704 = XTE J0052-723 = SXP 4.78 as Be-XRB pulsar in the SMC. gained significant experience by following parts or the complete program. Massive stars affect strongly the insterstellar medium through their intense stellar winds and their rich chemically processed material as they evolve. In specific short-lived transition phases (e.g. B[e] Supergiants, Luminous Blue Variables, Yellow Hypergiants) the mass-loss becomes more enhanced and usually eruptive. This leads to the formation of a complex circumstellar environment, which is not always well understood. To improve our knowledge on these phases we examined the structures found around the B[e] supergiants for a sample of Galactic and Magellanic Cloud sources. Using high-resolution optical and near-infrared spectra, we examine a set of key emission features ([OI], [CaII], CO bandheads) to trace their physical conditions and kinematics in their formation regions. Assuming Keplerian rotation of the circumstellar material we find that each B[e] Supergiant is surrounded by a unique distribution of single and/or multiple equatorial rings. Moroever, we find that these structures seem to be more stable and long-lived around single stars rather than binaries that show significant spectroscopic and photometric variability. Almost all confirmed optical counterparts of HMXBs in the SMC are OB stars with equatorial decretion disks (OBe). These sources emit strongly in Balmer lines and standout when imaged through narrow-band Hα imaging. The lack of secure counterparts for a significant fraction of the HMXBs motivated us to search for more. Using the catalogs for OB/OBe stars (Maravelias et al. 2017) and for HMXBs (Haberl & Sturm 2016) we detect 70 optical counterparts (out of 104 covered by our survey). We provide the first identification of the optical counterpart to the source XTEJ0050-731. We verify that 17 previously uncertain optical counterparts are indeed the proper matches. Regarding 52 confirmed HMXBs (known optical counterparts with Hα emission), we detect 39 as OBe and another 13 as OB stars. This allows a direct estimation of the fraction of active OBe stars in HMXBs that show Hα emission at a given epoch to be at least ∼ 75% of their total HMXB population. 1. There were only two monitors at each hall, so if somebody else was talking over their poster you had to wait… and wait… and wait… It happened to me that I wanted to show my poster to a colleague but some other people were in front of the monitor for such a long time that it became obvious that it would be easier finally to show it through my laptop. 2. It was not finally that appealing to use as somebody would have to go and see the list of all posters and select each poster to see in detail. In other words you couldn’t browser the posters like what you do when you walk around in the poster session. It would have been much nicer to have the posters rolling somehow randomly in the monitors and continuously to widen their visibility. 3. Interactive it might have been but it was not easy to navigate (e.g. change the session and see another than the active one at that time), while in many cases there were a few bugs (zooming in that resulted in hiding some presentations, or crashing during the slide change). 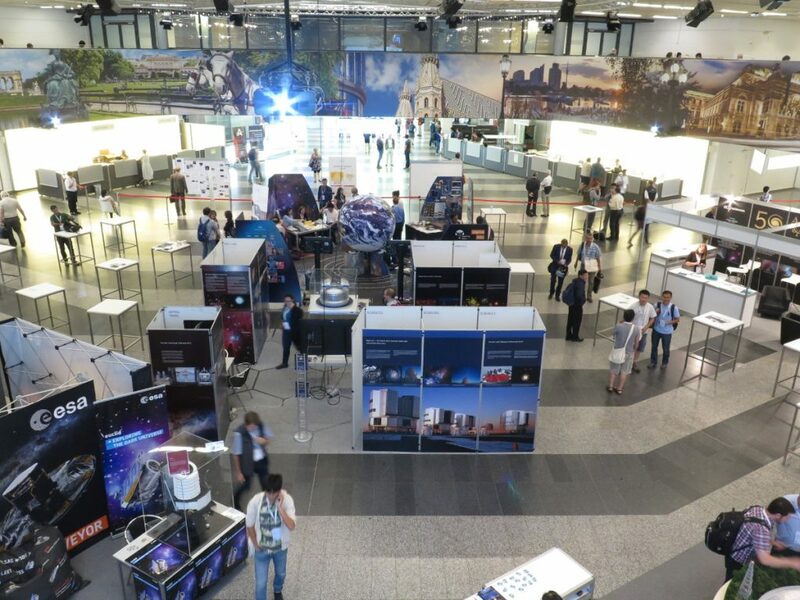 The second week of the XXXth GA started very early actually as they were actually 3 plenary talks of the IAU 346 Symposium on “High-mass X-ray binaries: illuminating the passage from massive binaries to merging compact objects” (which actually deserves a post of its own, if I ever manage to make…). 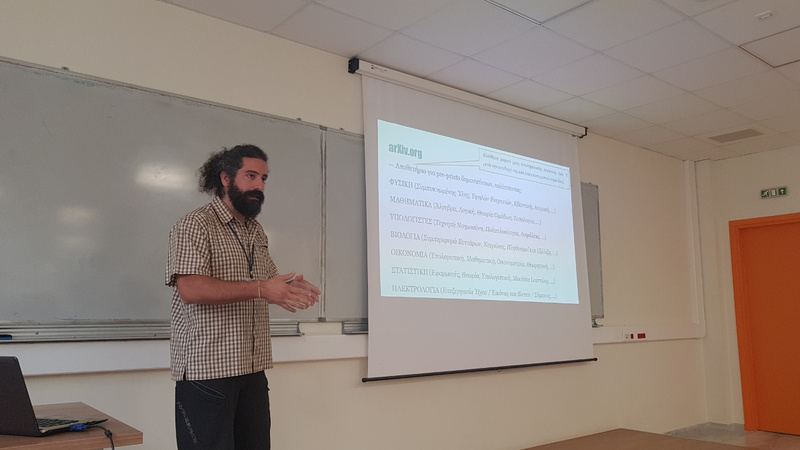 After that, we had the second day of the Division Days where I had a talk (in Division G) on the B[e] Supergiants (see for more the post on my contributions to this GA). Apart from the scientific part there were again a lot of people (with an important percentage being different from the first week) going around the exhibition and the various happenings. One of them was of course the General Assembly itself. 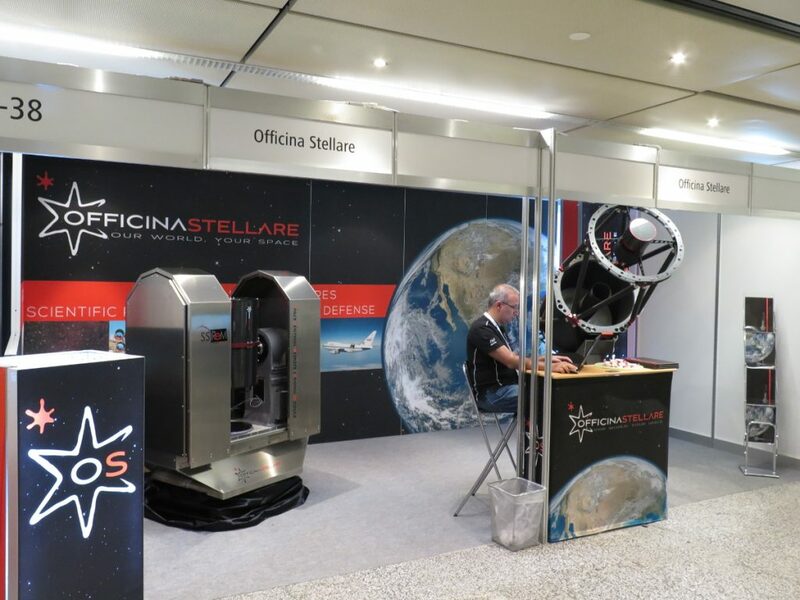 The booth of Officina Stellare. 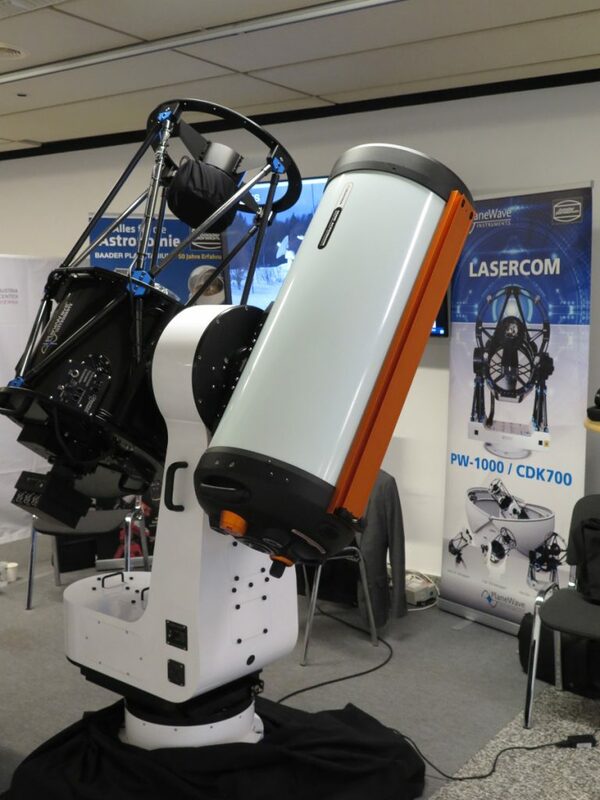 Display of a telescope system from PlaneWave Instruments. The booths of ESA, ESO, and of the IAU’s Office of Astronomy for Development (2nd week). 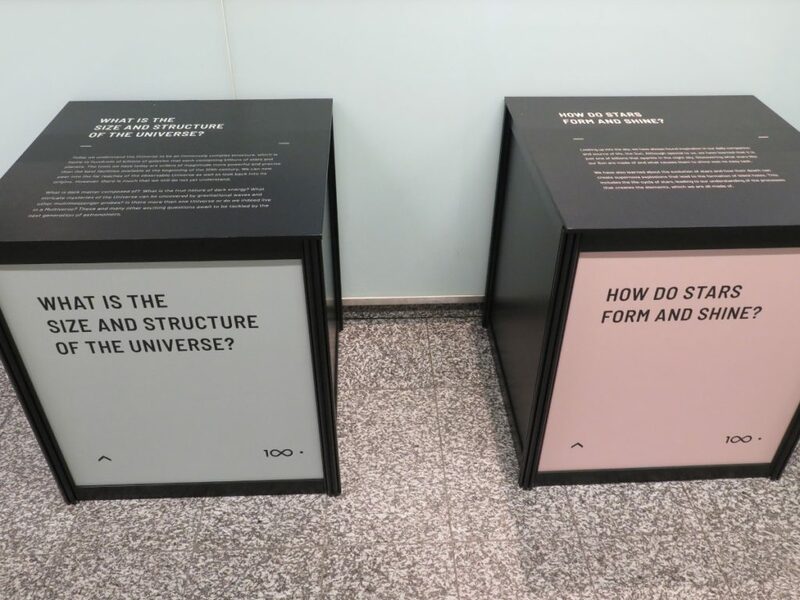 Exhibition “boxes” for the 100 years of the IAU. One of the key issues to discuss in this assembly was the suggestion to rename the Hubble law to Hubble-Lemaitre law. There was actually a lively discussion with arguments from both sides. 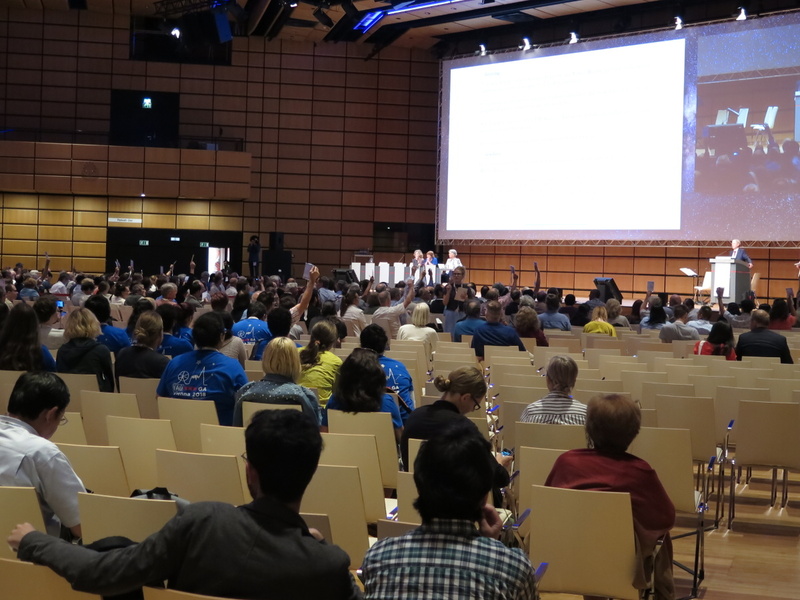 An indicative voting was made but the final decision will be based on a more detailed poll sent to all members of the IAU. 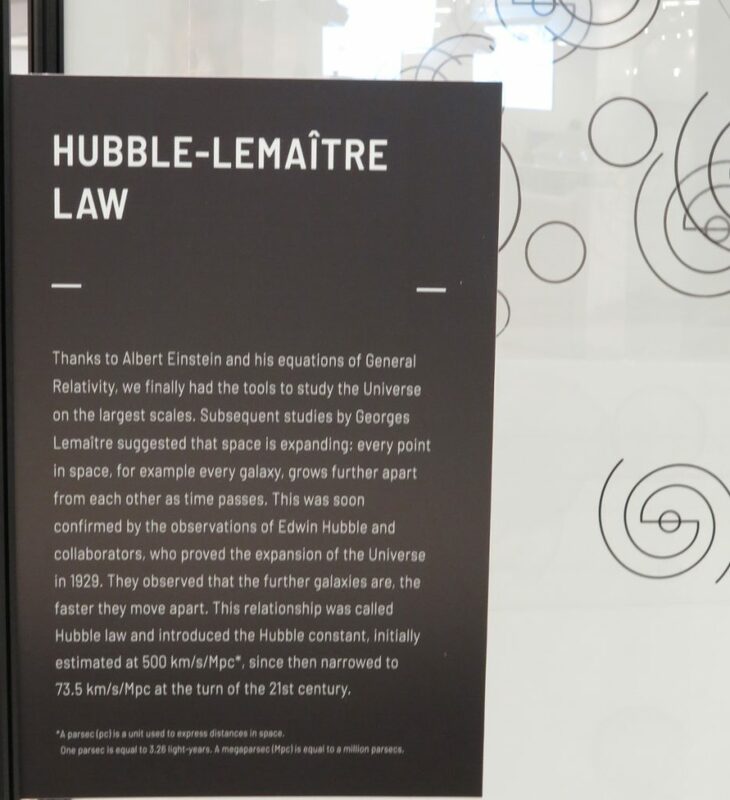 Although not formally decided, the revised Hubble-Lemaitre law was presented. The, indicative, voting process for the Hubble-Lemaitre law. Then, the assembly proceed with more bureaucratic issues (among which was also the approval of new members, such myself!). 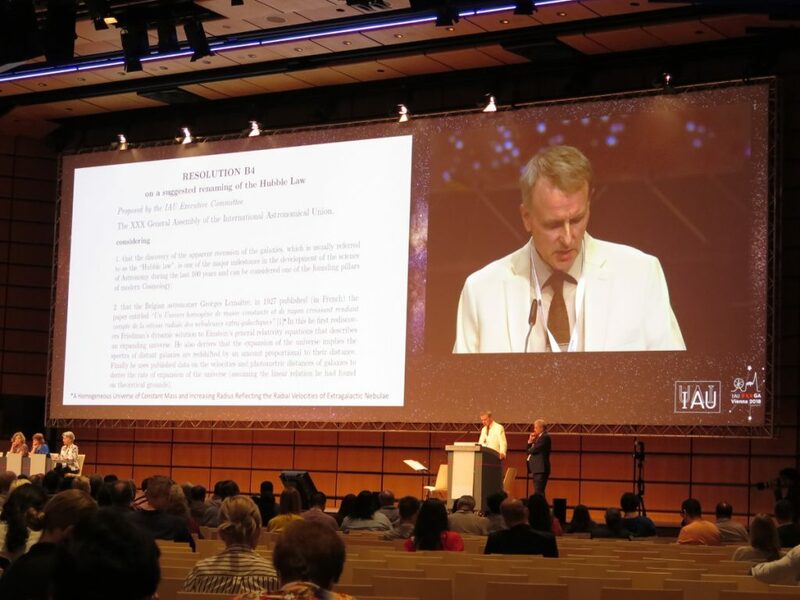 Last but not least, there was the announcement for the organizer of the IAU GA of 2024 (as for 2021 is Korea) which is South Africa (after a strong competition with Mexico). The GA resolved with some folklore dance and music. 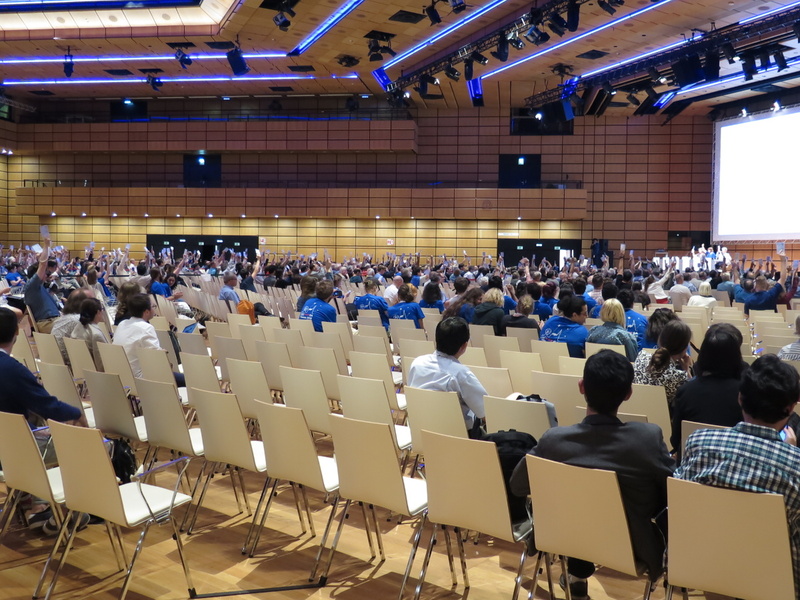 Another voting process during the IAU General Assembly of 2018. 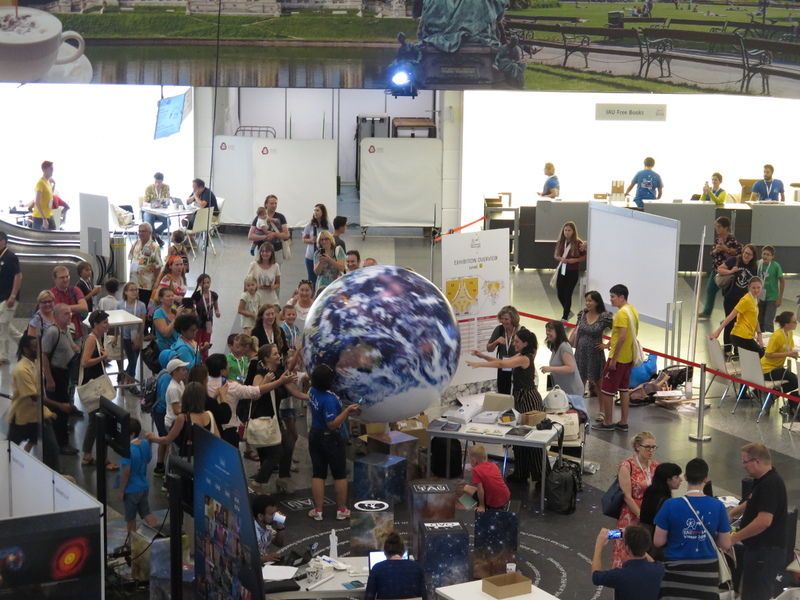 At the very end of the GA, kids and adults (mainly from the IAU’s Office of Astronomy for Development) were playing with this giant Earth-like balloon. The final day ended a bit earlier than others allowing us a bit more more time to relax. After all it was almost two weeks of many conferences and meetings in parallel that had developed considerable tiredness. I was more than happy to return home the next day and rest a bit more over the weekend, and enjoy some of the promotional stuff (see below!). 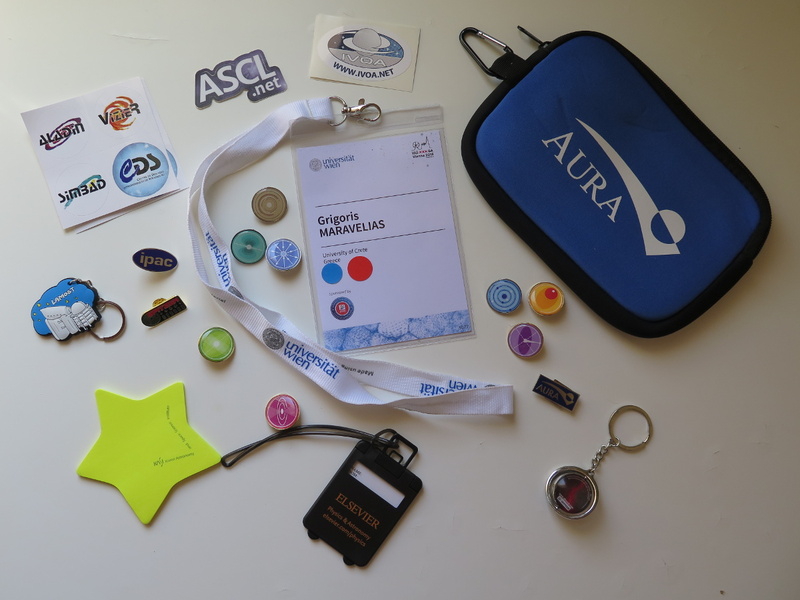 A small collection of various promotional stuff (pins, stickers, etc) and my badge from the IAU GA 2018 (and I have actually forgotten to put some more…!). Various stuff from the IAU GA. I actually won this t-shirt at the lottery of the Korean booth (!). Conferences feed the brain … but the body needs fuel too! 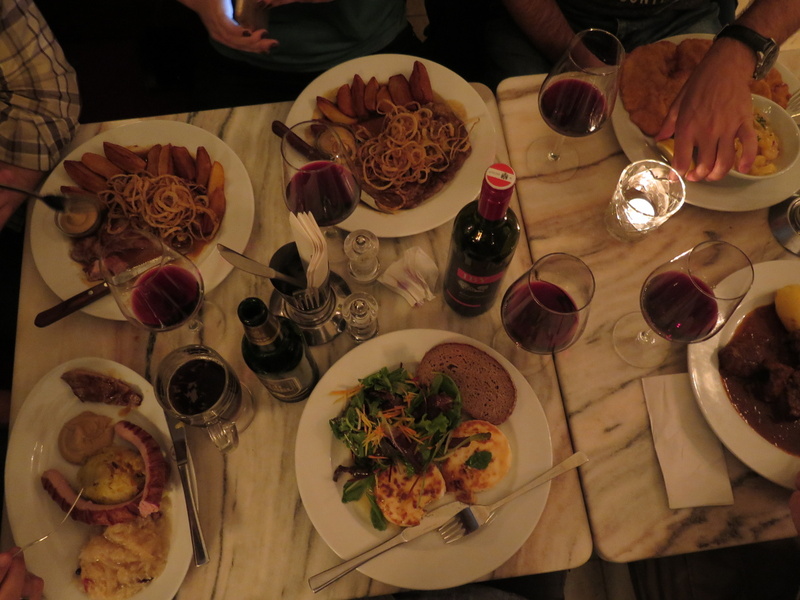 Enjoying some local Viennese cuisine and wine. On the previous weekend (October 13-14, 2018) the 11th Free and Open Source Software Communities Meeting was held in Heraklion of Crete (Greece). This is the Greek conference of the communities that develop free and open source software (such as Mozilla, Fegora, etc.). Although the meeting focuses on programmers and students it is open to all parties with a strong interest in open processes including other areas beyond just the software, such as hardware, society, economy, etc. Starting in 2008, it has been organized in 6 different cities so far (but not in Heraklion! ), gathering a few hundred participants each time. Traditionally Astronomy is a collaborative science in the sense that many researchers collaborate to observe a phenomenon, and they share their observations for further analysis and interpretation. Building upon this tradition many observatories today make available their observations so that modern astronomers have access to large datasets. Additionally, the technological advance of the instruments allows the observation of the Universe almost at the entire electromagnetic spectrum, even at the very recently confirmed gravitational waves. Thus, the modern astronomers are not only required to understand the Astrophysics behind these huge datasets but often they are called to develop the own necessary tools to conduct their research. Given the knowledge and the vast volume of data available today the collaborations are, more than ever, vital (especially with the forthcoming large projects that are currently built, e.g. 30m telescopes). 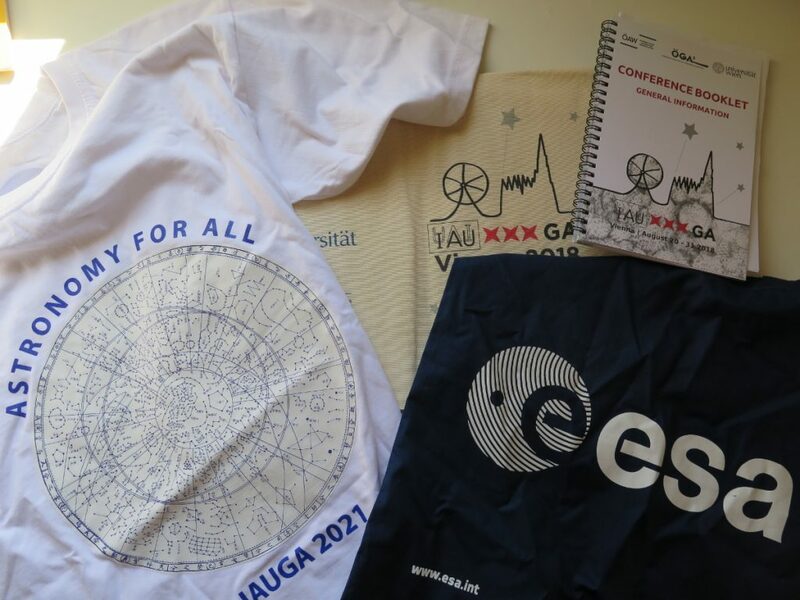 In the framework of modern Astronomy we are going to present successful examples of how open approach has been applied. This particular talk is released under the CC-BY-SA license, so we are going to provide all necessary material along with the presentation. Although in Greek, most probably an english version will become also available in the future. In Zickgraf et al. 1989 (A&A, 220, 206) there is a comment on the density of the disk around the supergiant LHA 115-S 18. In Table 1 they provide (following Waters 1986) the mean particle density at r=R* for a number of sources: 3.2 x 1012, 2.6 x 1012, 4.6 x 1012, 1.7 x 1012 cm-3 for sources S 18, S 12, S 134, and R 126, respectively. Having calculated a maximum disk radius of 300R*, they calculate a mean density of few 109 cm-3. These values are consistent with both estimates from IR emission and by McGregor et al. (1988), who independently found densities of about 109 cm-3 from the CO first overtone emission in S 12, S 134, and R 66. 55 mySQL queries in 0.469 seconds.